Former Taiwanese President Lee Teng-hui reiterated his stance that the island is independent of China, and slammed Beijing over its criticism of his visit to a Tokyo war shrine, as he wrapped up a trip to Japan on Saturday. A Chinese man, apparently angry over his remarks, hurled a plastic bottle at Lee at Tokyo's international airport as he arrived to board his return flight, police said. China claims sovereignty over Taiwan and has repeatedly threatened war if the self-governing island tries to formalize its de facto independence. Beijing accused Lee of using his Japan visit to push for independence, though the former leader has defended his trip as "private." Beijing also rebuked Japan after Lee visited Tokyo's controversial Yasukuni Shrine, which honors Japan's war dead, complicating relations between Beijing and Tokyo. 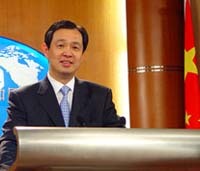 Speaking to reporters Saturday, Lee reiterated his longtime position that Taiwan is independent. "Taiwan is already an independent country," Lee said. "It is natural that the Taiwanese people clearly assert that Taiwan is theirs, and that Taiwan is an independent country based on peace and democracy." He also accused Beijing of overreacting to his recent pilgrimage to Yasukuni, and of using the issue to divert attention from problems at home. Taiwan is a former Japanese colony and Lee's elder brother, who was killed in 1945 while serving with Japan's navy during World War II, is listed among the 2.5 million war dead honored at Yasukuni. Lee said that because his family never received his brother's remains, he did not have another place to commemorate him and that a visit to the shrine was an appropriate way to pay respects. But China views the shrine as a glorification of Japan's militaristic past, because it also enshrines executed war criminals, and strongly objects to public figures visiting the site. Yasukuni has been a frequent flash point between Japan and China, which suffered under Japanese colonial rule. "The Yasukuni problem was invented by the Chinese and Koreans because they could not deal with problems in their own country," Lee said. "I see no problem with countries honoring young soldiers who gave their lives for their country," he said. "That is not something that foreign governments should criticize." Later Saturday, a Chinese man was arrested after throwing a plastic bottle at Lee at Narita International Airport, according to police official Takeaki Akaike. Lee was unhurt in the incident, Akaike said. Lee served as Taiwan's president from 1988 to 2000. He has been a strong critic of Beijing, which continues to claim sovereignty over Taiwan more than five decades after the two sides split during a civil war.